The Write Taste Review of Maynard House Orchards Apple Juice. 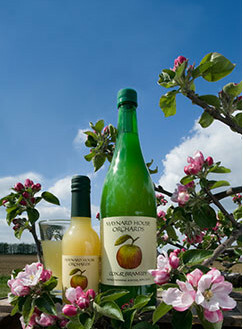 Maynard House Orchards are an award-winning producer of apple juice from Suffolk. They mainly supply the on-trade, but their juices can also be found in good farm shops around the East of England. 2012 has been a particularly good year for this family business, as they have been celebrating two Gold 'Great Taste Awards' – a Two Star Award for their 'Cox and Bramley' juice and a One-Star Award for their 'Apple & Raspberry' juice. Reflecting their growing list of accolades, sales have increased this year by 20% and the company now supplies apple juice to top establishments, such as the Fat Duck restaurant in Bray and London’s Grosvenor House and Bulgari hotels. The Great Taste Awards scheme, established in 1994, is run by the Guild of Fine Food and is "the acknowledged benchmark" for speciality food and drink in the UK, being the industry equivalent of the 'Oscars'. It attracts over 8000 entries every year, each receiving feedback from a panel of over 350 adjudicators and is highly coveted within the fine food sector. The scheme is independent, uses a rigorous judging approach and is trusted, not just by retailers and buyers, but importantly also by consumers who can see the black & gold-star 'GREAT TASTE' logos on winning products. Maynard House Orchards was founded by the Williamson family who have been growing apples in the East of England since 1934. The current farm, near Bury St Edmunds, has been producing apple juice since 1992 and has always concentrated on quality and depth of flavour, through their judicious use of particular apple varieties suited to the East Anglian soil and climate. These include Cox’s Orange Pippin, Bramley, Egremont Russet, Discovery and their latest heritage variety, Kidd’s Orange Red, a crossing of Cox and Red Delicious, brought over from New Zealand in 1931 by Frederick E. Williamson, the grandfather of current owner Clive Williamson. Indeed, new saplings of Kidd’s Orange Red were planted at the farm last year and more are planned for the future, enabling the company to increase its production of this unique, sweet and intensely-flavoured apple juice. All apples at the farm are hand-picked, which guarantees that only the ripest and best quality fruit is selected. Pressing, blending and bottling in glass are all carried out on-site and the gentle pasteurisation process ensures that good depths of aroma and flavour are retained. Maynard House Orchards consistently achieve SALSA (Safe and Local Supplier Approval) recognition for their high standards. This approval scheme enables producers to demonstrate that they satisfy industry-accepted food safety standards and exceed the minimum legal requirements. In fact, the company’s ethos of vowing to "never sell out to giant supermarkets" ensures that standards are kept high from year to year. Raspberries are pressed along with apples to produce this beautiful blush-coloured drink. Ripe fruit notes on the nose and palate characterise this refreshingly sweet and tart full-flavoured juice, which could be drunk on its own or enjoyed with cheese or dessert. Naturally seeded elderflowers from hedgerows around the orchards are used to create a cordial which is then mixed with apple juice to produce this crisp, refreshing and deeply-flavoured drink. The palate is sweet, yet tart and the elderflower does not overpower, but adds a subtle perfumed note to the aftertaste. This juice would make a great non-alcoholic accompaniment to rich game dishes or a spicy Thai curry. By mixing the sweet and rich flavours of the Cox apple with the sharp and strongly-flavoured Bramley apple, Maynard House Orchards have created a rich, medium-dry and full-flavoured apple juice. This would make a refreshing drink at any time of the day, but its tangy, fresh and fruity flavour also means that it works extremely well with hard cheeses or rich meat dishes, like venison stew, roast goose or chicken liver paté. This cloudy apple juice has a distinctive aroma and a rich, sweet and complex flavour. Best enjoyed chilled, it would make a beautifully smooth and refreshing non-alcoholic alternative to wine or beer. Maynard House Orchards have also launched a "Warm Spiced Apple Juice" spice mix for the cold winter months. The spices, including cinnamon, cloves and allspice, come in dissolvable sachets or muslin bags and, similar to mulled wine, should be added to apple juice which has been heated to 50-60°C (1 sachet per one litre of apple juice). The company recommends using their Cox and Bramley apple juice and, for an extra kick, adding a tot of Dark Rum or Calvados! Maynard House Orchards apple juices can also be ordered online and come in cases of either 24 x 240ml, 12 x 750ml or 12 x 1 litre bottles.